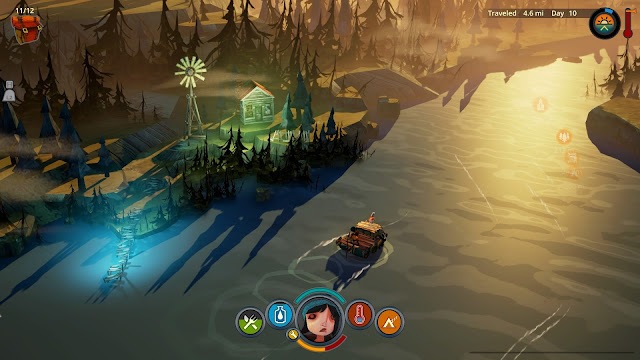 The Flame in the Flood draws on the quintessentially American story of a life lived along a river, echoing a theme often found in the great American works of literature, film, music, and history. 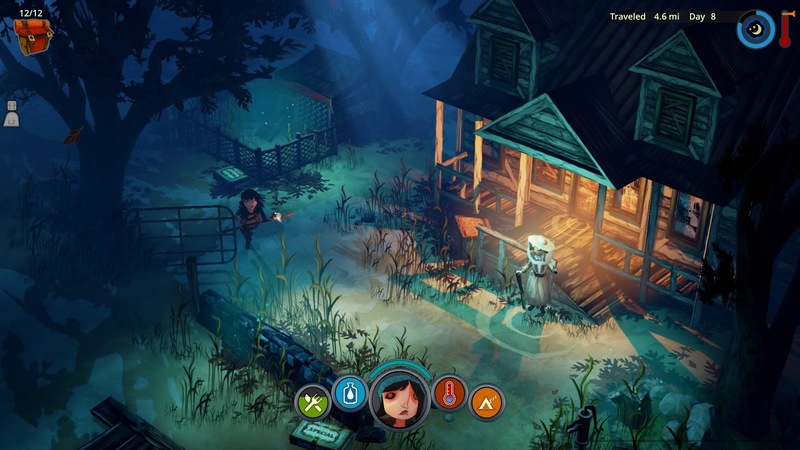 More than that, it explores the moments of being that exist in the face of a disaster, making the best of a bad situation and ultimately tinkering one’s way to survival, and even thriving. Though the setting calls upon a once-tamed river breaking its shackles and engorging itself on new waters in the form of a flood, there are still parallels to be found in a transient existence. The stories of Huckleberry Finn as written by Mark Twain hold as a guiding light for a way of life left behind, but that idea of taking to a river and just getting by sits at the core of The Flame in the Flood. There are echoes too of the strained cords of William Elliott Whitmore, a named influence on the soundtrack of the game, to the point that one could throw on Lifetime Underground or Lift My Jug while playing and have a similar tone remain. That acknowledgement isn’t intended as a slight on Chuck Ragan, but a nod that the commentary did send me a separate way investigating. 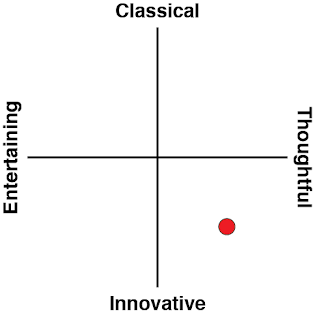 It’s Ragan that brings the music to the game, very distinctively, and his contribution permeates through the game’s sounds, songs and soul. Not having been exposed to the river experience outside of how they’re presented in media, it’s hard to tell if these are experiences still common or if that cultural touchstone is a romanticised memory shared only through fiction now, but the shrinking state of the world implies that making do is less common as our own personal frontiers gradually disappear. It could be that we’re facing a world where those experiences that we find so formative in terms of our identity are no longer available, and instead in their absence there is only emptiness, and that we might never be able to share roadtrips across the country, a weekend spent camping and fishing, or a vacation along a river like ones we or our parents had. From the title it’s clear that we hail back to that experience through the tragedy of a flood, with nature being a lethal yet still benign force that can strip away the comforts and controls, and put us right there in a situation where we have to rise and persevere. Perhaps it’s only in the face of a disaster that we can rise again to greatness. 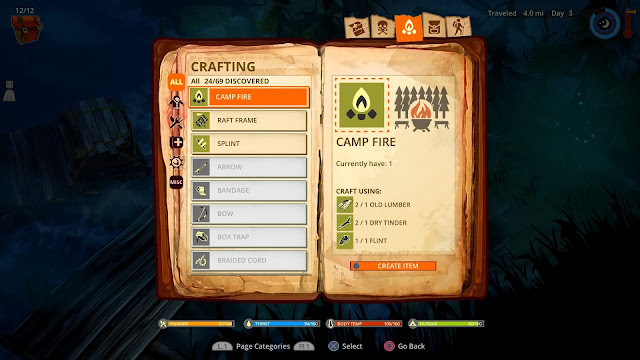 Flame opens its game in a summer camp, the last sanctuary before a treacherous journey, but it is not here that the story begins. The transition from title screen to action centres on the actions of Aesop or Daisy, the dog that becomes the faithful sidekick and sometimes saviour to the main character Scout. Whatever machinations of circumstance exist that bring Scout to the flooded river, it’s through the dog that the journeys are tied together, but right there in the beginning, so too is the prediction of how each journey will likely end. 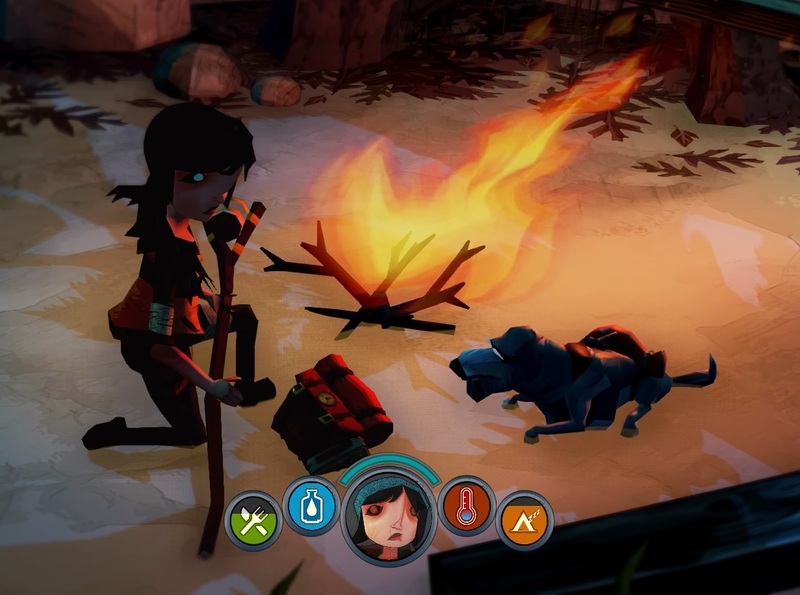 The dog pulls a backpack away from a skeleton, and drags it through the dark woods, until it finds Scout taking shelter at a campfire. That first camp raises its own questions - another memory that I can only presume to be a real, shared experience of many that reside in that proud nation on the other end of the Pacific, but from the framing of the setting, another that may yet be a relic. The camp in question, where the adventure begins from, shows signs of being in disarray. Though its entrance is spared the ravages of the flood, the cabin and office suggest they’d been abandoned for a long time. The journey that ensues covers more than the landscape of the theoretical park, with buildings and stores found along the way. Some of the environments seem more run down than others, raising a question over whether the environment might have been that way before the flood. This might be a case of reading more than developer, The Molasses Flood, intended, yet it implies that not only have these locations been torn apart by the river, but that we’re looking at towns and the like that were already struggling to make do. It does this without disdain, presenting them sombre, and ultimately creating them as things that have been patched up to serviceable. When we find cars rusted over, bearing a supply inside the bonnet, or a yellow bus that gives us shelter from a stormy night, it’s not clear if these lands are pockets that have since run dry, or if those spots were like this before. It doesn’t matter what the reason for their current state is, since we’re still placed into them as Scout, and playing each hand dealt out. The river itself fights with us as we go, and though we might want to head one way or another, it often refuses to yield, whether it is calm or in a rage. The raft we use along the way can be upgraded, but as a vessel to deliver us to safety, it’s less fit for purpose than we are. The rapids that you head across offer a gamble, carrying you down farther, but testing your control over the raft and raising the odds you might miss where you want to stop. Many a Scout might have their raft dashed against the banks of this swollen river, but it’s the only means of hopping from island to island in this flooded spot. As a game of survival, food, water, weather and rest are the necessities you need to watch for, but it’s in the unexpected that you will find the greatest challenge. The Flame in The Flood plays to consequence, meaning that simple cut is a death knell if you’re unable to treat it. You’re also at the mercy of the invisible dice when it comes to finding resources, and some of the things you’re holding on to will be far more valuable than others. One of the most intelligent things about The Flame in the Flood, and full credit to the commentary for spelling it out, but for the most part you’re about as lethal as you are in your day-to-day. A boar that wants to end your day is going to be all kinds of trouble, and unless you’re all ready and prepped for it, the most you can do is try to scare them off and head for your raft. The sooner you realise that waving your stick around ain’t going to solve your problems, the sooner you can start using your brain. Goes for the game, too. My best, most tense experience with the game over my time playing, came curled up by a campfire. I’d laid it out, cooked a rabbit and had a nap. I was all set to head back to the raft, when I noticed a shadow lurking just outside the ring of light cast by the fire. It wasn’t the first time I’d happened across such a skulking grey, and recognised it for the wolf that it was. 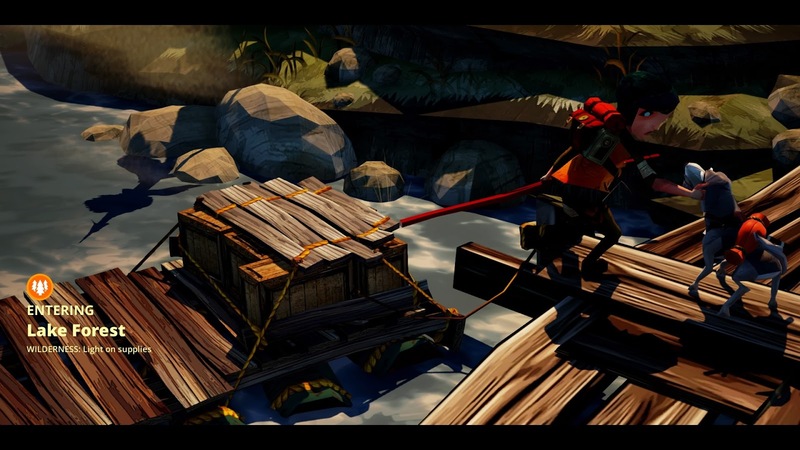 Panic hit me as I knew I had only a slim chance of getting back to the raft without the beast dooming me to die. I peered back into my inventory, hoping I might be able to craft something that’d help me out of this, and I saw for the first time I was able to slap together a spear trap. This wasn’t at all like the snapping kind I’d used on a rabbit prior, but one I’d have to lay out on the edge of the light, and hope the wolf wouldn’t draw too near. I wasn’t even sure that the wolf would continue to lurk back from the fire, and any kind of dallying on my part could cause a sudden rain to put out the fire - then I’d be lost for certain. I circled around the fire, hoping to draw the wolf closer to one side, then ran back to the other to assemble some of the trap. The wolf came dangerously close to me while putting it together, but not enough to snap my way. Once laid out, it teased me, keeping just outside my range again but also shy of the trap. It took another few turns to draw it out, bring it closer, and ultimately it sprung the trap. It was a perfect combination of being caught by surprise, yet having the resources at hand to deal with it. 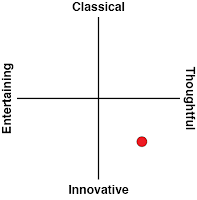 Early on in playing, there are a number of effects or problems that you’re not prepared for or mightn’t even know they’re possible, but it is the sort of game where you learn more and do better each time. A less successful story is the one where I managed to get bitten by a snake five times, passed out, then woke up starving, dehydrated, and died. Nature doesn’t mess around. Ragan’s Soundtrack of the game makes an immeasurable contribution to the tone. I’d originally played a while, mostly quiet, just enough to make out the notes and sounds, but turned it up for the sake of the directory commentary. That act threw the music back into the mix of elements, and it brought a raw emotional pull to Scout’s exploration, the world of Flame, and even to travelling down the river on my rinky-dink raft. For those starting out and perhaps not confident, you might want to peek into the options menu, as you can choose whether the dog’s inventory carries over to subsequent plays. It can be the edge you need to last a few sections more. The easiest difficulty will make resources more common so your scrounging won’t come up empty, and offers checkpoints once you make it a certain way down the river, so you can pop back and see if it takes you some place different. You can make it more challenging of course, and even engage in an endless mode once you’ve had your fill of the campaign. There are a lot of moments of beauty, where the sun casts colours upon the surface of the river, though much like Twain’s essay on Two Ways of Seeing a River, the more familiar you become with the game, the less these moments present as endemic to a place, and instead as cues for conveying information, or in the case of some environments, they become their utility rather than their concept. The gameplay continues to thrive outside these moments of wonder, meaning that even once all is familiar, a visceral elegance still remains - the detail in the models and animation mean that each setpiece feels tangible, even with a stylised design. It somehow ties this style with that idea of consequence, so that even when the end lies a few, a misshapen skull drawn over Scout’s portrait is at once cute and grim. 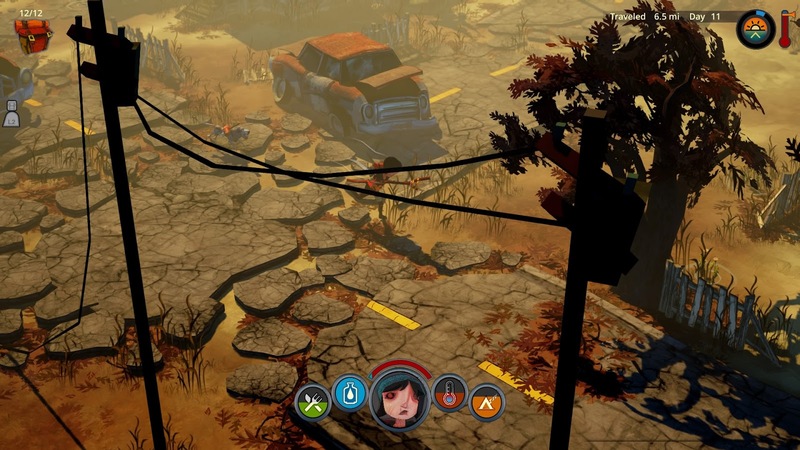 What stands out most about The Flame in the Flood is that its form of survival isn’t candied up, but sits severe and plain about what chance most of us would have. It’s second even to the slice of America it presents, a piece of a soul set upon a shelf, hoping to be called upon once more. 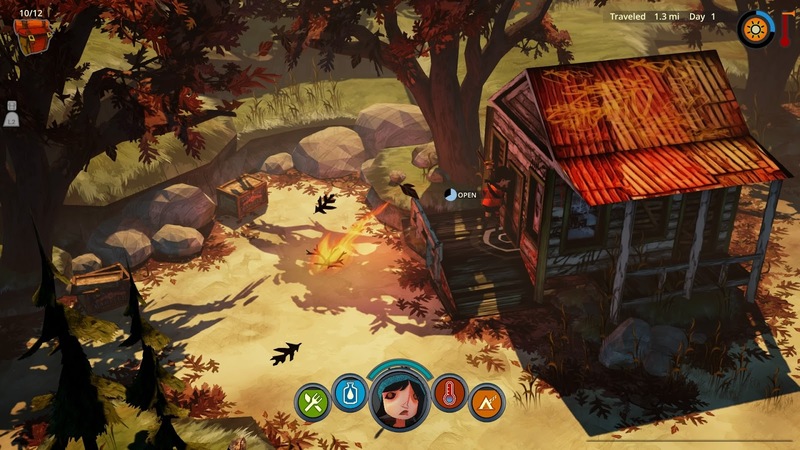 If nothing else, The Flame in The Flood allows that piece to have its moment with sincerity.